When Mr. Al and I moved, we had to say buh-bye to our cable TV network and hello to one of the satellite ones. We picked DISH because of their Hoppers and Joeys. How cute is that? Little kangaroo references can’t be beat. Anyway, the TV has always been the domain of Mr. Al because I prefer reading and cannot stand the fear-factor-marketing. Blech. But, when my Joey was hooked up to my little Kitchen TV, I discovered the bliss of the Warm and Fuzzy station: The Hallmark Channel. It’s like watching a romance novel, with as much goo and mush as you can handle. It’s great! And with Christmas right around the corner….Oh My God! Be still my heart. AND…I can record the movies and hop right through the fear-factor-marketing-commercials. All is well in the Williams household, although my dinners seem to be a little more overdone of late. In two weeks, the 8th of November, the all-day Book Release Gathering on my FaceBook Author page is happening. My Author Assistant is doing most of the prep work. I’m going through my learning curve and she has many more contacts than I and she knows how to use them. So, I gave her access to my page. Who knew you could do that? But, yes, more than one person can administer a FaceBook page. You simply need to “friend” the person and set it up. So while my assistant is administering, I’m having fun thinking up my giveaways. I’ve got a couple of tote bags and long-sleeved tee shirts that are really cool. I’ve got a couple of Amazon gift cards and, of course, copies Sky Dancers, the whole reason for this Gathering. Have a great week, Peeps! I will be extending an invitation to you regarding next Saturday. Feel free to stop by and introduce yourselves. 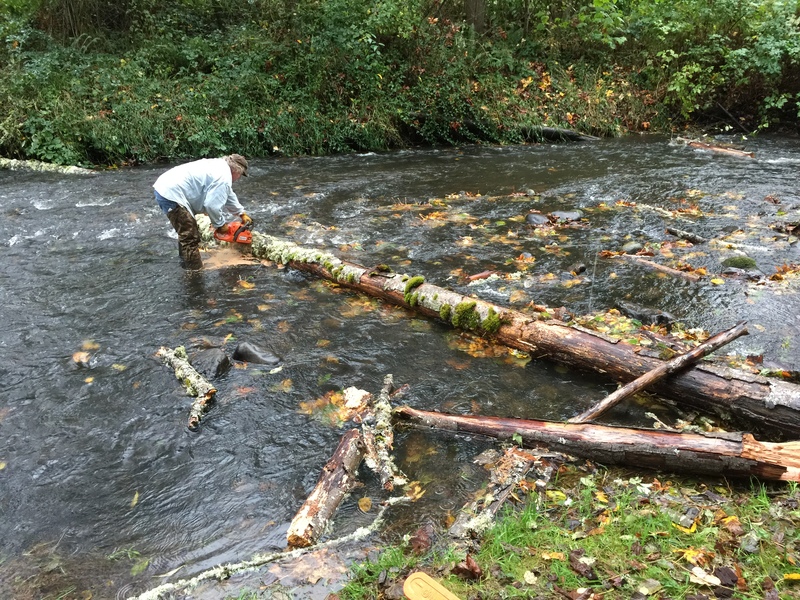 I leave you with a picture of Mr. Al doing a little creek maintenance. Since it’s been raining, the water is rising. 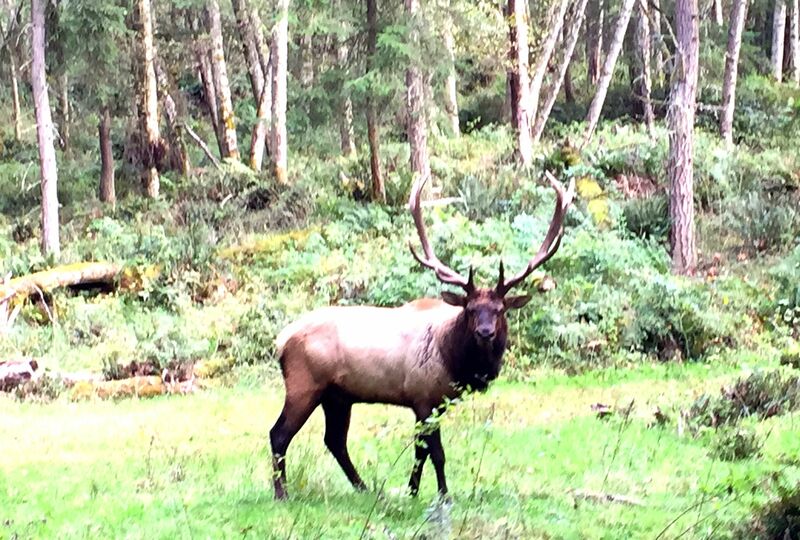 And a majestic elk taken last weekend at the Northwest Trek, which is a really cool place to be. I’m looking into volunteering there. Or at least being a member. Good things happening at that place. Happy beasts. Take a look at the close up. 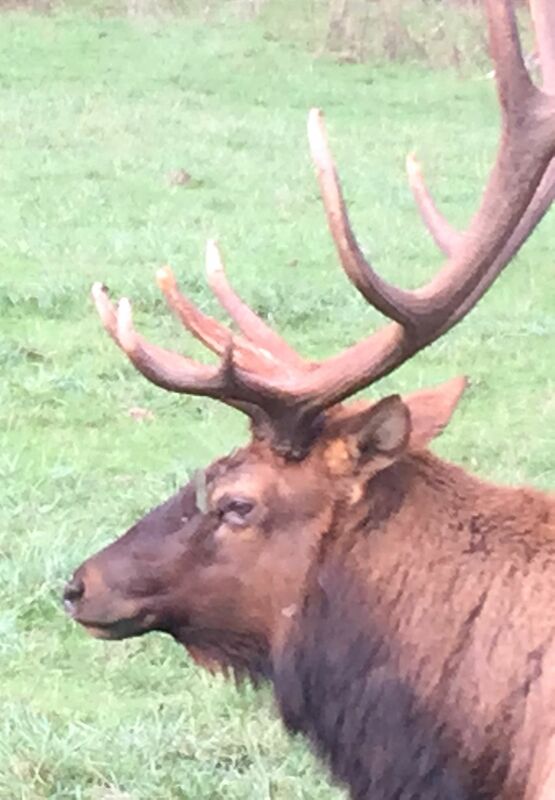 See how the antlers just fade into the light? And the green is mirrored in his face? How some lines are sharp while others just fade leaving no boundary between the subject and the background? Those are the little things I miss about painting and teaching painting. When you’re a painter, you learn a whole new way of looking at your surroundings. We’re not just stuck here on this planet like colorforms on a board, if you can even remember what colorforms were. No, we’re a part of it all. We blend and merge with it. We are Nature and Nature is us. Truly lovely warm fuzzier for a Sunday. Thank you! Next Next post: A Book Is Born!